Between 1660 and the death of George III a hundred years later, the number of crimes that could be punished by execution increased by 190. This not only included petty theft but crimes against property such as the destruction of machines or the removal of fences that enclosed the common land. The first permanent gallows was set up at Tyburn in 1571. Londoners were also executed at Smithfield and Tower Hill. However, by the 18th century Tyburn Tree, a triangular gallows, became the main place for public executions in London until it was replaced by Newgate in 1783. The gallows at Tyburn stood near the present-day Marble Arch, at the north-east edge of Hyde Park. From Newgate Prison the condemned prisoners were conveyed in open carts along Holban, St Giles and Tyburn Road (now Oxford Street) to the Tyburn Tree. The procession would stop several times, including at the Old Bailey in Newgate Street and the Bowl Inn in St Giles. At these places the condemned prisoner would be offered wine. Five children under fourteen were executed before 1800. However, of the 103 children sentenced to death for theft at the Old Bailey between 1801 and 1836, all were reprieved. 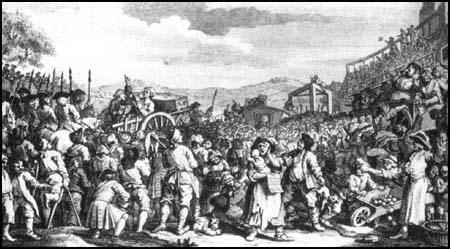 Of the 1,232 people hanged at Tyburn between 1703 and 1792, only 92 were women. It has been estimated that 90% of all those executed were young men aged under 21. 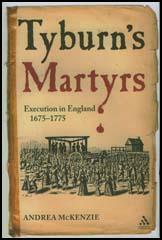 Most Mondays a crowd of around 10,000 people attended the executions at Tyburn. When the case had received a lot of publicity, numbers could reach 50,000. When Arthur Thistlewood and the Cato Street conspirators was executed at Newgate in 1820, an estimated 100,000 watched the proceedings. 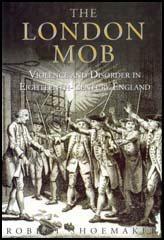 (1) Samuel Rogers watched people on the way to be executed at Tyburn after the Gordon Riots in 1780. I recollect seeing a whole cartload of young girls, in dresses of various colours, on the way to be executed at Tyburn. They had all been condemned for having been concerned in (that is, perhaps, for having been spectators of) the burning of some houses during Lord George Gordon's riots. It was quite horrible. (2) Elizabeth Fry was one of the few people who campaigned against the death penalty in the 19th century. In March 1817 she saw Elizabeth Fricker just before she was executed. Afterwards she wrote about the meeting in her journal. Her hands were cold, and covered with something like the perspiration preceding death, and in a universal tremor. There were also six men to be hanged, one of whom has a wife near confinement, also condemned, and seven young children. A strait waistcoat could not keep him within bounds: he had just bitten the turnkey; I saw the man come out with his hand bleeding, as I passed the cell.